Geothermal Cooling via Baseboard Heat Flushing? Engineers and armchair experts, could someone run the numbers on this for me? The water coming out of my tap is cooler than my home. If I hooked up a garden hose to the drain of my baseboard water heating system, flushed the room temperature water out of the house and into my yard, thus replacing the water in the system with fresh, cool, tap water, could I generate a significant cooling effect (thus, taking pressure of my AC unit)? Would any heat transfer into the pipes? Would a fan on the pipes make a difference? Author Ed KohlerPosted on July 16, 2012 Categories Energy5 Comments on Geothermal Cooling via Baseboard Heat Flushing? 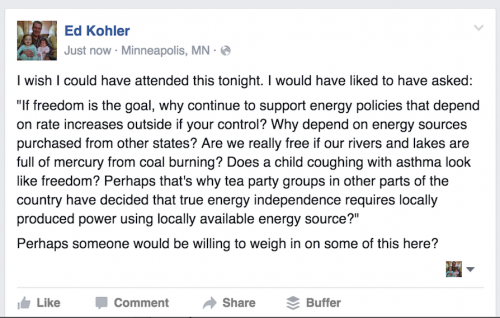 The Xcel Energy Windsource program is a deal where you can opt-in to have your home’s energy come from wind power rather than asthma generating, mine shaft collapsing, black lung generating, water polluting sources. While the power sent to your house isn’t coming directly from wind turbines, Xcel is required to source their energy from wind sources in proportion to the number of people who opt-in. When I first joined the program around 5-6 years ago, the net cost for me was around $7/month. That was affordable, and it felt good to do it. As I’ve managed to reduce my energy consumption, that has dropped to around $5/month. Notice that I paid an extra $4.98 to have my energy sourced from wind turbines. Now, check out the “Fuel Cost Charge”. This is where non-Windsource users were jacked an extra 2.85 cents per kWh to cover the costs of dirty energy like goal and natural gas. 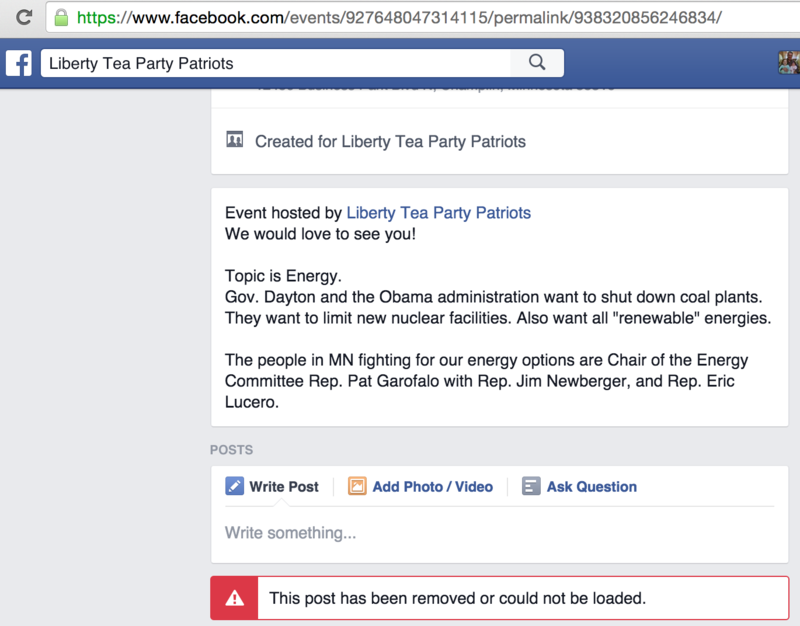 But, they couldn’t jack me because I don’t play that dirty energy game. Instead they kicked that back as a rebate, bringing my net cost for switching to non-asthma generating, mine shaft collapsing, black lung generating, water polluting sources: 96 cents. Ask yourself: Is 3.2 cents per day too much to pay to avoid using electricity from asthma generating, mine shaft collapsing, black lung generating, water polluting sources? I would hope not. It’s an easy choice, and only takes a minute: Sign up now. Back in October of 2009, I installed a TED-5000 Powermeter that ties into the Google Powermeter reporting system. This allowed me to get a much better feel for what was chewing up energy in my home and do something about it. We made a few changes around the home, including installing a few more CFL bulbs. However, the biggest energy improvement came from swapping out our refrigerator for a new model. 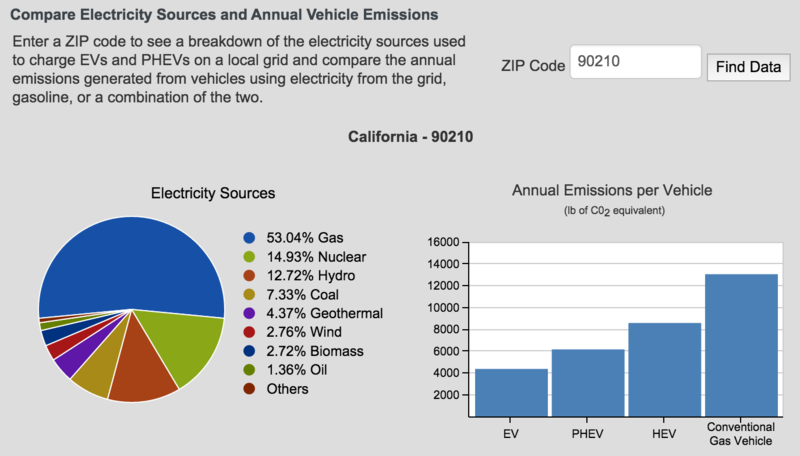 For those keeping score at home, that’s a 23%+ decrease in energy consumption. 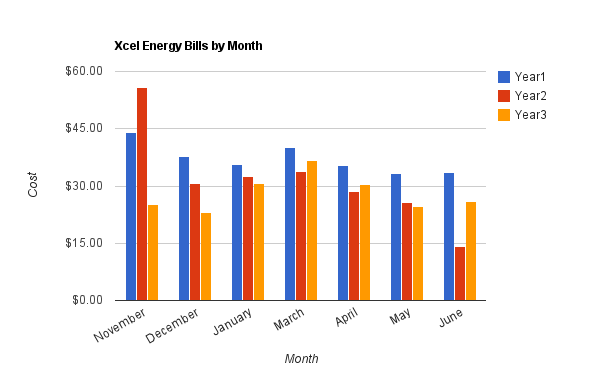 It’s also worth noting that the monthly costs include paying for the Xcel Energy Windsource program, where Xcel is required to acquire energy from wind related sources in proportion to the number of people who participate in the program. 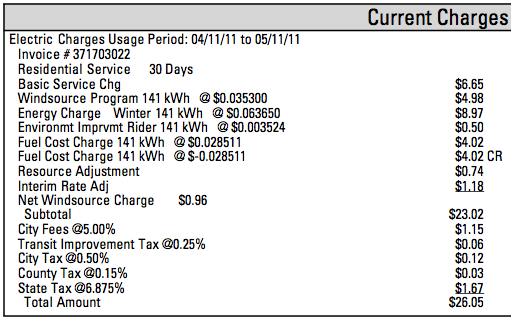 I’m not quite off the grid yet, but less than a dollar a day electricity bills aren’t exactly breaking the bank. If you have a solar electric system on your house, there may be times when your solar panels generate more energy than your home consumes. This net energy can be uploaded onto the grid for use by other power consuming neighbors or businesses. 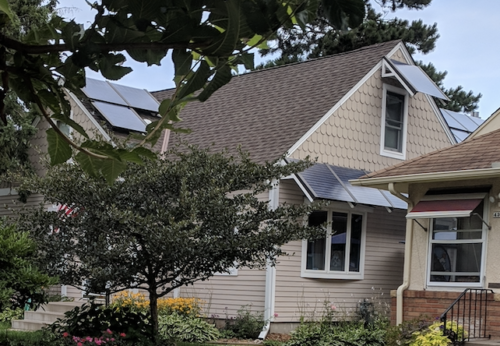 This is a good deal, because it increases the percentage of clean electricity sources while allowing you to offset some of the costs you invested in your solar system. Put another way, you can literally make the meter run backwards. At what rate does the meter run backwards? Under current state law, the meter runs backwards at the retail rate. Power companies like Xcel Energy buy the energy you contribute to the grid at the same rate you normally pay them. For example, if you have your thermostat set to turn off your A/C during the day while you’re at work, the intense sun during the day would likely generate net energy that could be used to cool occupied office buildings. This is a time when the meter would run backwards. When you get home, you may use more energy to cool the house, cook, or do laundry, thus using more energy than your panels are likely generating at that hour. Essentially, you could generate clean energy for Xcel Energy during some of their highest peak demands, which is good for everyone. One would think. Pathetically, the Minnesota GOP thinks this is a BAD IDEA. Instead of making the meter run back and forth to at an even rate, they’d like to change it to a one step forward two steps back model. By that, I mean that they want Xcel to be able to buy your excess electricity to you at wholesale and sell it right back to you at retail rates. That’s right. They want you to only earn wholesale rates on the clean energy you created during the peak demand hours of the day, then pay retail rates to earn it back when the meter runs forward. You can thank Rep. Michael Beard (R) of District 35A (Shakopee, MN) and Rep. Tom Hackbarth* (R) of District 48A (Cedar, MN) for this proposed dirty energy handout. Not just anyone would propose taking away incentives for investments in home solar energy systems. Reps Beard and Hackbarth have the courage to stand in favor of asthma, mine shaft collapses, black lung, natural gas fracking, and water pollution. Or, maybe they’re just standing in support of campaign donations from power companies? Is there a difference? That’s $1,300 in campaign contributions from electric utilities. $1,300 may not sound like a lot, but it Rep Beard’s total campaign contributions were $19,733. Of the $19,733, $5,893 was from public election subsidies and $1,200 from self-funding, so the $1,300 accounts for more than 10% of his campaign’s outside money contributions. Clearly, those utilities would be getting a HUGE return on their investment in Rep. Beard if that amendment passed. Thankfully, this story has a happy ending. In spite of the efforts of power companies to buy a horrible change to our state’s energy acquisition, common sense won out. This amendment by Reps Beard and Hackbarth was tossed out. In case it’s not already clear that Beard and Hackbarth’s utility funded ideas are not good for Minnesota, here’s another perspective: I’ve been considering installing a solar system. As I understand the numbers, the energy potential of five typical panels would cover my home’s gross energy needs. That would not cover peak load, but it would more than cover the base load when no one is home and the A/C is off. Under current state law, this would allow me to get my electric bill down to nearly zero. But, if I’m going to do this, it would make sense to put as many panels on the roof as fit, since they represent only a fraction of an entire solar project’s cost. 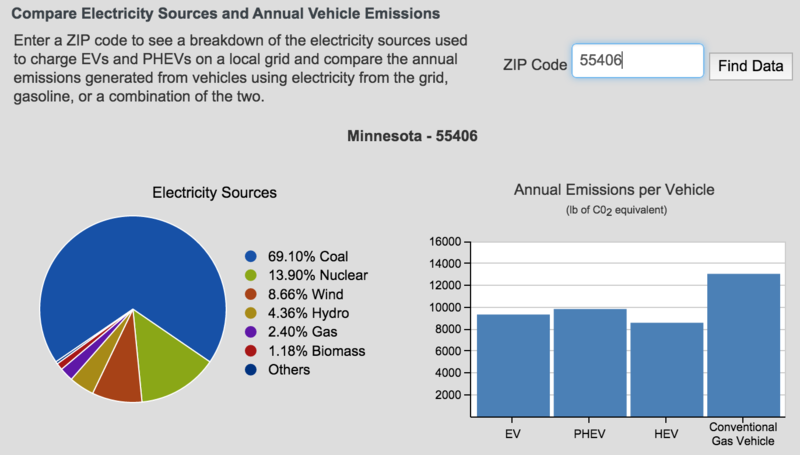 Why not make the meter run backwards by contributing enough energy to the grid to power a second Minneapolis home? If Reps Beard and Hackbarth had their way, the incentive to do this would be much less since the payout on the investment in clean energy would go up by years. 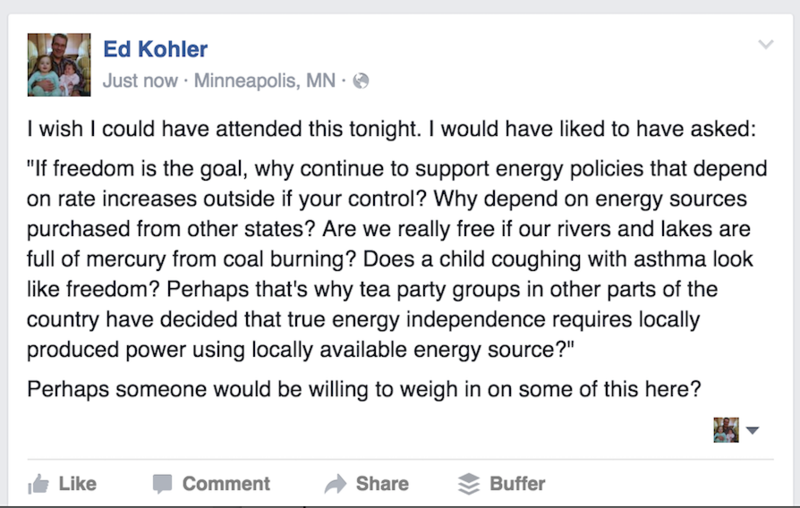 Why take away my incentive to invest in improving the quality of our state’s energy sources? Try putting common sense ahead of campaign dollars and sense, guys. 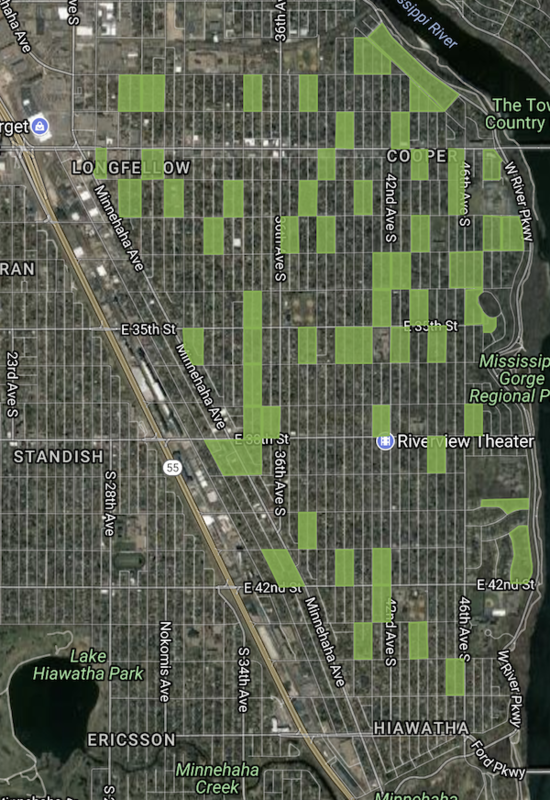 * Yes, this is the same Rep. Hackbarth that was cruising St. Paul’s Highland Park with a sidearm last fall in search of a woman he had met online. 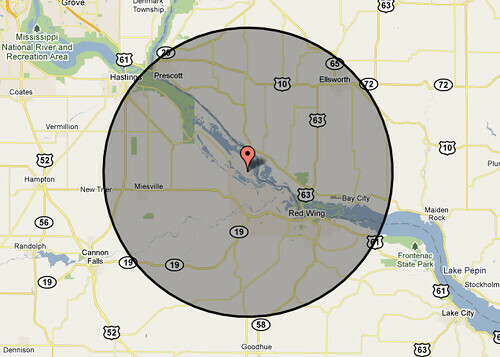 You can try this with the location of your choice here. I recently gave Centerpoint Energy a ring and asked if they could pull the records on what Carly and I have been paying for natural gas used in our home over the time we’ve owned it. CenterPoint provides up to 15 months of data on their website (login required) but will print and mail larger data sets. Ideally, I’d like to see the red line (Year 2) below the blue (Year 1) with the Gold line (Year 3) below the red. To achieve that, I need to progressively decrease what I’m paying CenterPoint Energy for natural gas. I believe this is a complete list of how natural gas is consumed in my house. I’ve tried to rank them based on how much natural gas I perceive each system consumes annually. Over time, we’ve made a few changes around the house that I assume helped lower our natural gas consumption, but the feedback loop isn’t as precise as it is with the Google PowerMeter used for monitoring electricity. Here’s what I think has helped. Water Heater Blanket – I don’t think we’ve reduced the amount of cooking, grilling or laundry we’ve done in summer months, so the drop may be tied to the water heater blanket I purchased and installed in April 2009. I paid $26.21 for that at the time, so it may have paid for itself in only a few months. If it cut my gas costs by as little as 10 cents/day, it’s already paid for itself. Door Sweeps – When we moved in, you could literally see light entering the house from below the doors. Closing the obvious gaps with door sweeps cost less than $40. Expanding Foam Sealant – $5 spend on this stuff helps close drafts in tough to patch areas. For example, our front door has a skeleton keyhole that would shoot air into our home that’s 100F colder than indoor temps on coldest days. A few cents worth of foam shut that down. Don’t get this stuff on your hands. Attic insulation – I found Owens Corning’s attic insulation calculator valuable for determining how much insulation my attic could use. Since there was already stuff up there, I picked up around 14 rolls of R-30 insulation to roll out on top of what was there. My total cost of supplies (including a face mask, gloves, and box cutter) was under $200. Rolling out the insulation took around 3 hours. I was itchy for a day after that. Before do-it-myselfing this, I also got a quote from a company that would blow in insulation. That was $2,000 rather than $200. Programmable Thermostat Adjustments – I can’t imagine not having a programmable thermostat in a house these days. They’re cheap and help save a ton of energy since you’re only using as much energy as you need to be comfortable at any time of the day or week. The cost from $25-$100 depending on how complex a model you’d like (I use a relatively simple 5-2 model where it has one setting for weekday wake-up, mid-day, evening, and overnight temps and a second setting for the weekend routine). We got a bit more aggressive with our overnight low temp this year, which probably accounts for some of our more recent savings. At this point, our overnight temp is “chilly on the couch but perfect for sleeping” with the heat ramping back up starting early enough in the morning to make crawling out from under the covers comfortable. Then it drops off during work hours. Painless savings. Like I said earlier, it’s tough to correlate individual projects with energy savings since the feedback loop on gas consumption is so poor. 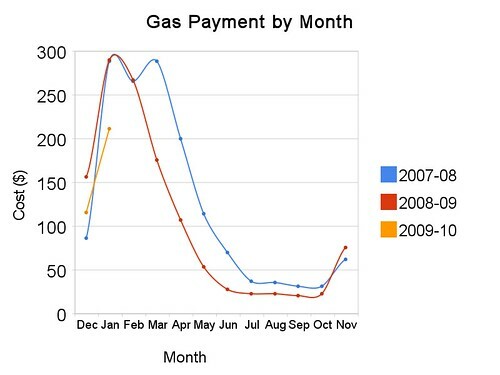 What I do know is that we spent $269 less in our second year in our home than the first on natural gas. We saved around 315 therms worth of natural gas. Converting that to a car gasoline’s energy (btu) equivalent, we burned 252 gallons less gas without compromising on comfort. Good stuff.